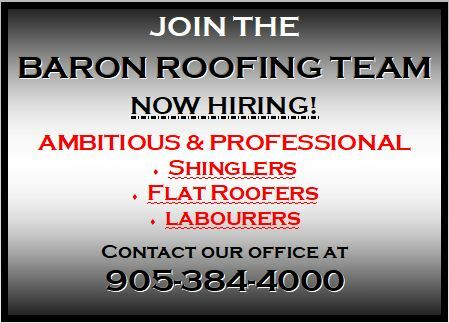 At Baron Roofing & Siding Ltd., we install products with a proven record of durability and longevity. Every product we use is backed with a manufacturer’s warranty that protects your investment. By ensuring that we meet every manufacturer’s specifications, we’ve received the highest certifications from North America’s largest shingle manufacturers. GAF – Baron Roofing & Siding is an authorized installer under the GAF Master Elite® Contractor program. As a Master Elite® Contractor, we can offer you an extended, 20-year, GAF Smart Choice® System Plus Ltd. Warranty (non-prorated for material and labour). The Master Shingle Applicator program teaches every aspect of shingle installation techniques, as well as the procedures for installing all CertainTeed shingles. The program utilizes the Shingle Applicator’s Manual and covers a variety of topics, including: good workmanship practices, roof systems, estimating flashing, ventilation, and product installation. This training gives our team the ability to install all of CertanTeed’s shingle products. IKO is a family-owned company that has provided quality residential and commercial roofing products since 1951. The company lives by its motto: setting the standard. IKO sets the standard for quality, durability, and innovation. As a ShieldPRO Plus™ Roofing Contractor, we can offer you ShieldPRO’s Extended Iron Clad Warranty Protection. VELUX – Baron Roofing & Siding is a certified installer of roof windows and skylights for over 15 yrs. IHSA – The IHSA is the leading developer and provider of prevention solutions for work environments involving high-risk activities, such as: working at heights, working with high voltage electricity, driving motor vehicles, transporting dangerous goods, suspended access, and hoisting and rigging. As part of this system, we are recognized by the Ministry of Labour, the Ministry of Transportation, the Ministry of Training, colleges and universities, and the Workplace Safety and Insurance Board as designated trainers and consultants. You can be sure that the training you get from the IHSA meets regulatory requirements and compliance standards. WSIB – Our Workplace Safety & Insurance Board clearance certificate is available upon request. Baron Roofing & Siding also carries $5,000,000 of comprehensive, general liability insurance.